Bajaj V12 launched in India | IAMABIKER - Everything Motorcycle! 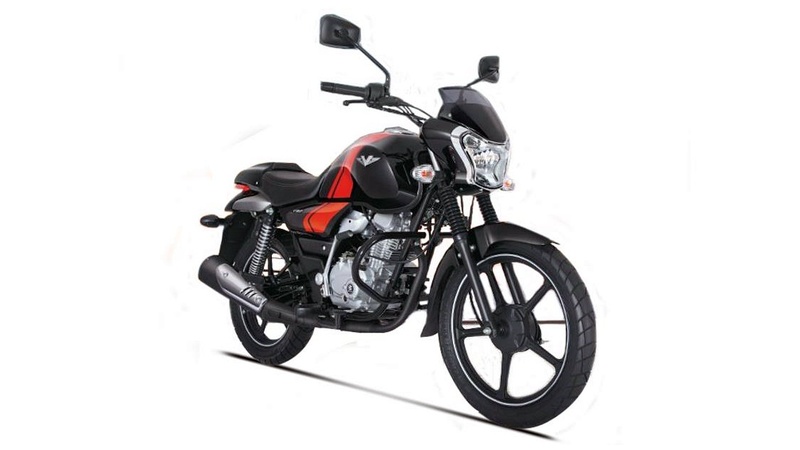 Flush with the success of the Bajaj V15, Bajaj has quietly launched the 125cc variant in the V series, the Bajaj V12 . The smaller displacement sibling is styled pretty much identically to it’s older brother, with the trademark front and sweeping tail section. Bajaj have done a good job utilising contrasting paint and stripes to enhance the visual appeal of the bike. Not only has Bajaj downsized the engine, other components like the suspension and brakes too have taken a step back. Smaller 30 mm diameter forks instead of the 33 mm diameter forks on the V15 and 130 mm drum brakes all around rather than the front disk/rear drum setup of the V15 are found on the Bajaj V12. The instrument console is similar to the V15 but is missing the digital fuel gauge. The tires are skinnier 18 inch 90/90 front and 16 inch 100/90 rear with a tube. Bajaj claims that an updated version with a front disk, tubeless tires and the Always Head Lamp On (AHO) feature will be launched soon. Once again, Bajaj claims to have gone for an all-new motor for the V12. The 125cc mill is said to put out 10.7 PS of power at 7,500 RPM and 11 Nm of torque at 5,500 RPM. Expect some vibrations at the top of the rev-range. The five-speed gearbox should help make optimum use of the available power for both city and highway scenarios. A relaxed seating position courtesy of the raised bars, mid-mounted pegs and small windshield upfront should make for a comfortable ride. The kerb weight of 133 kilos should also make the bike easy to handle. The V15 sure was something new in the market and the V12 promises to continue that trend. The Bajaj V12 has been priced at INR 56,283 (ex-showroom Delhi) and is available in Wine Red and Ebony Black colour options for now. A few more colour options and other features like on its elder sibling could be introduced later down the line depending on customer response.